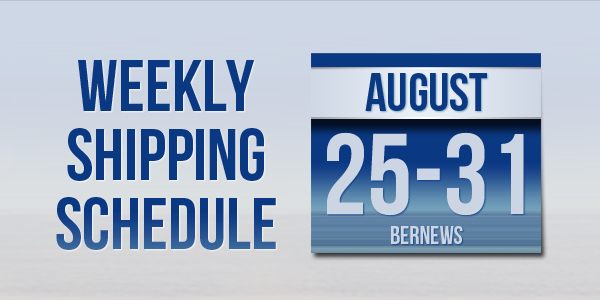 The Department of Marine & Ports Services has released the weekly shipping schedule for ship arrivals commencing on Saturday August 25th. On Sunday the Polaris Ace vehicles carrier, the Norwegian Dawn cruise ship and the Oleander container ship will arrive, on Monday the Grandeur of the Seas cruise ship is scheduled to arrive, and on Tuesday the Somers Isles container ship is expected. On Wednesday the Norwegian Escape and the Celebrity Summit cruise ships will arrive, on Thursday the Bermuda Islander container ship and the Industrial Faith general cargo ship are scheduled to arrive, and on Friday the Insignia cruise ship will arrive.